In the wake of Michael Brown’s killing and the Ferguson uprising, I am reminded of these passages written by Dr. Martin Luther King, Jr. and President Lyndon Johnson’s National Advisory Commission on Civil Disorders, commonly known as the Kerner Commission. Both quotes reflect hard truths about the history of black uprisings in the U.S.—they are not the products of criminality or pathology; they are responses to longstanding grievances against racial and economic inequality. And in light of the Ferguson uprising, we should all take note of one argument advanced by Dr. King and the commissioners: America refuses to acknowledge how generations of structural racism have created the conditions for black rebellions. According to Dr. King and the commissioners, the key to preventing future uprisings was confronting structural racial and economic inequality directly. This was the lesson, and the task, that President Johnson, and many other Americans towards the end of the 1960s, could not fathom. Ultimately, the evasion of national responsibility during the late 1960s helped lay the foundation for future black uprisings. 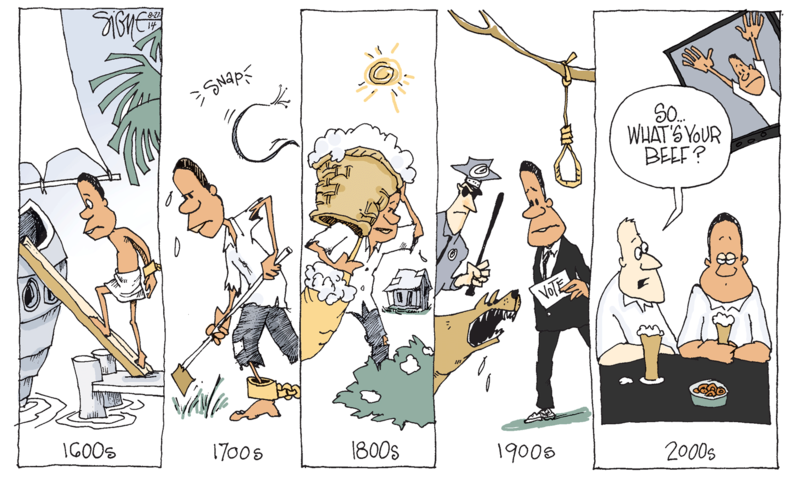 Editorial cartoon by Signe Wilkinson. Lyndon Johnson’s response to the Kerner Commission epitomized King’s and the commission’s contentions about whites’ inability to address structural racism and to understand the meanings of black equality. And as the works of Heather Ann Thompson, Radley Balko, and Michelle Alexander have shown, this period signaled a turning point as the federal government intensified the war on crime and neglected the war on poverty. President Johnson announced the formation of the Kerner Commission on July 29, 1967, shortly after the Newark and Detroit rebellions. The commission consisted of an array of civil rights and labor leaders, along with elected officials, such as Illinois Governor Otto Kerner. Johnson charged the group with investigating the nation’s riots without regard to the administration’s views on urban affairs. “Let your search be free,” Johnson insisted. For Johnson, the commission’s “free inquiry” yielded unexpected results. Commissioners produced a preliminary document, The Harvest of American Racism: The Political Meaning of Violence in the Summer of 1967, in December. The document argued that racist institutions created the conditions for uprisings. The report also appeared to validate rioting as a political act. While the report condemned particular acts that it saw as criminal, like looting, it often referred to urban rebellions as “political” and “a rational tool” to confront racism. The interim report was never released. According to a report published in the black newspaper, the Michigan Chronicle, former members of the commission suspected that the Johnson administration tried to bury the document. Johnson’s response may appear surprising considering his administration’s civil rights record. However, his reaction was not only the product of his stubbornness and unwillingness to take criticism. Johnson exemplified how many white liberals tend to react strongly (and negatively) when their commitment to eradicating structural racism is challenged. The suggestion that his administration had not done enough to address racism offended the President. Johnson learned that his administration’s role in passing the civil rights and voting rights acts and his good intentions could not protect him from the blowback of oppression. Johnson’s refusal to take the commission’s arguments about white racism seriously, in addition to the failure of corporate post-riot jobs programs and the eventual restructuring of national urban policy, created a void that the war on crime eventually filled. President Johnson first announced the war on crime in 1965, and he signed legislation establishing the Law Enforcement Assistance Administration (LEAA), which distributed federal money to state and local law enforcement. As the war on poverty declined, LEAA funding rose—from $63 million in 1969 and $268 million in 1970 to over $529 million in 1971. In the midst of the Ferguson upheaval, Washington Post writer Merlin Chowkwanyun and historian Heather Ann Thompson reminded us, rightfully, that policymakers have ignored past studies produced in the aftermath of the 1960s urban uprisings, especially the Kerner Commission Report. They are right, but the real lesson is not just about evasion and forgetting. The real lesson is how Johnson actively worked to kill the commission and bury its findings because the cost of change was too much to bear. President Johnson’s establishment of the LEAA laid the foundation for the militarization of police forces that Ferguson protestors faced in August. The LEAA and Johnson’s war on crime also contributed to the growth of incarceration rates among African Americans in subsequent decades, thus further deepening racial and economic inequality in the U.S. 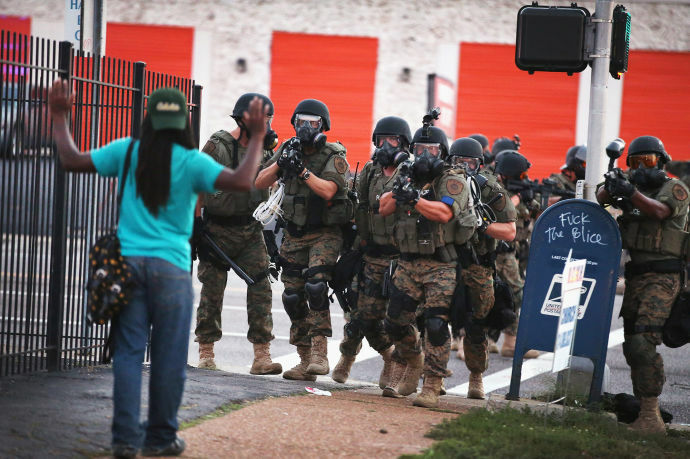 So, how should America respond to Ferguson? Many responses, especially those of elected officials such as Senator Rand Paul, the media, and the Obama administration, have concentrated on the militarization of police forces. While a heightened concern about police militarization is welcome, this strategy does not address the excessive racist policing that people of color have experienced historically. Michael Brown’s killing was not the product of militarization; it was the result of the criminalization of black men and women and the spaces they inhabit and travel. The killings of Brown, Eric Garner, and the beating of Marlene Pinnock resulted from the thievery of liberty by police forces. Americans have to confront the ways in which particular institutions such as law enforcement, the courts, and prisons, see black men and women as inherent threats to person and property, unworthy of individual liberty and due process. Yet, as many riot studies illustrate, police brutality merely triggers rebellions. 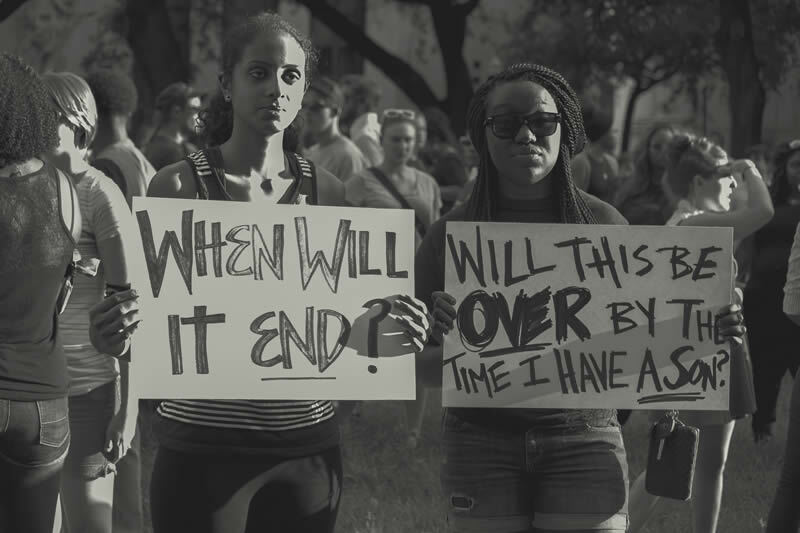 Black uprisings are collective responses to historical and contemporary patterns of residential and school segregation, uneven economic development within metropolitan areas, joblessness, political marginalization, and wealth and income inequality. The ultimate goal is to radically alter these patterns—eliminate the criminalization of people of color, reverse school segregation, and devise more equitable economic development policies. A third reconstruction is in order. Ferguson reveals the need for many white Americans to develop deeper understandings of race and racism. Much of white America possesses a superficial understanding of racial justice and racism that points to the absence of Jim Crow segregation, the Ku Klux Klan, and, ironically, racial terrorism as evidence that racism existed “in the past.” Instead, white views of racism emphasize individual acts of bigotry and any mention of race in conversation and in policy as the evidence of racism. In this context, whites often perceive themselves as victims of racial bias. Also, individualistic and behavioral understandings of race and racism trump evidence that a system of racial stigmatization, discrimination, and white privilege exists. The growing wealth gap between African Americans and whites, the targeting of African Americans by police tactics such as “stop and frisk,” and disproportionate rates of incarceration among people of color are all explained by individual irresponsibility, criminality, and pathology. *Featured image courtesy Mike Luckovich of the Atlanta Journal-Constitution. The history of policing and mass incarceration is rich. See Khalil Gibran Muhammad, The Condemnation of Blackness: Race, Crime, and the Making of Modern Urban America (Cambridge, Mass: Harvard University Press, 2010); Michelle Alexander, The New Jim Crow: Mass Incarceration in the Age of Colorblindness (New York: New Press, 2010); Heather Ann Thompson, “Why Mass Incarceration Matters: Rethinking Crisis, Decline, and Transformation in Postwar American History,” Journal of American History Vol. 97, Issue 3 (2010), 703-734; Radley Balko, Rise of the Warrior Cop: The Militarization of America’s Police Forces (New York: Public Affairs, 2013); Angela Davis, The Meaning of Freedom: and Other Difficult Dialogues (San Francisco: City Light Books, 2012). “President Calls for Free Inquiry of Nation’s Riots,” New York Times, July 30, 1967. Kevin Mumford, “Harvesting the Crisis: The Newark Uprising, the Kerner Commission, and Writings on Riots,” in African American Urban History Since World War II, eds. Kenneth L. Kusmer and Joe W. Trotter (Chicago: The University of Chicago Press, 2009), 208; “Secret Kerner Report Argues Rioting Helps,” Michigan Chronicle, February 10, 1968. For more on Johnson’s reactions to the report see, Robert Dallek, Flawed Giant: Lyndon Johnson and his Times, 1916-1973 (New York: Oxford University Press, 1998), 516; Taylor Branch, At Canaan’s Edge: America in the King Years, 1965-68 (New York: Simon & Schuster, 2006), 705-706. Law Enforcement Assistance Administration, 3rd Annual Report of the Law Enforcement Assistance Administration, Fiscal Year 1971 (Washington, D.C.: Law Enforcement Assistance Administration, 1971), 2. Martin Luther King, Jr., Where Do We Go From Here: Chaos or Community? 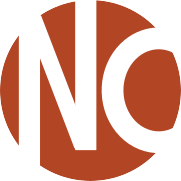 (Boston: Beacon Press, 1967), 22. Austin C. McCoy is a Phd Candidate in History at the University of Michigan. He is writing a dissertation on progressives’ responses to plant closings and urban fiscal crises in the Midwest during the 1970s and 1980s.